Clason's Guide Map of Arizona. This is a fine example of the Guide Map of Arizona by G. S. Clason. Issued to accompany Clason's Arizona Green Guide, this folding map covers the entire state of Arizona. A legend near the bottom of the map shows the state capital, (Phoenix) county lines, county seats, railroads, rail trunk lines, Indian reservations, national forests, automobile roads and main auto roads. An index on the bottom of the map lists towns with their population. The Green Guides were published by the Clason Map Company between 1906-1931. The 32 page booklet contains detailed information about various monuments, and other interesting facts about Arizona. It also lists road names and pole markings, logs and auto routes, rivers and creeks, springs and wells, a table of the shortest railroad mileage between Arizona towns, and a commercial index of Arizona cities and towns. The guide further includes full page maps of the business districts of Phoenix and Tucson. Though this map is undated, it was most likely issued around 1920 giving that it shows the Grand Canyon National Park, which was created in 1919. 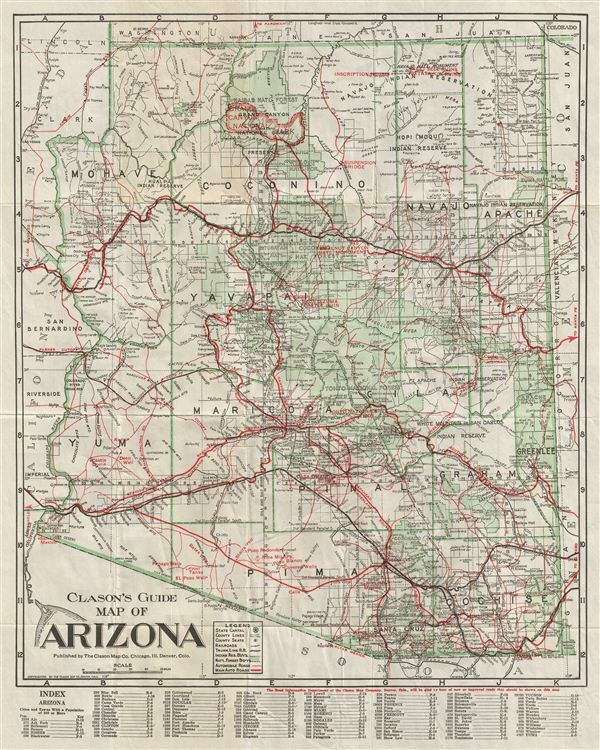 This guide map of Arizona was created by George Clason and published by the Clason Map Co., Chicago, III., Denver, Colorado as part of Clason's Arizona Green Guide. Clason, G., Clason's Arizona Green Guide., 1920. Very good. Original fold lines. Blank on verso. Accompanied by original companion booklet.